Today I want to introduce you to SKrafty, an online learning community for homeschool students. SKrafty has been around for 5 years now providing online classes, a learning community, AND a family friendly, moderated Minecraft server. SKrafty has something for everyone. 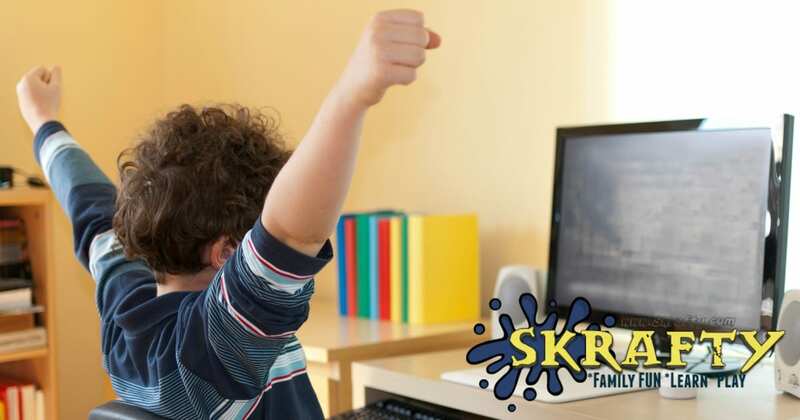 Gamers and non-gamers from K – 12th grade can take live courses, join online clubs and more on SKrafty. SKrafty is pretty well known as a safe homeschool Minecraft Server already. But, did you know SKrafty has live classes and self-paced classes for elementary through high school? In the live classes, students interact with teachers and their classmates in a collaborative environment! With SKrafty’s highly social community, they have essentially become a virtual co-op where friends interact and learn together. SKrafty has over 150 self paced classes to choose from in addition to live classes. Most classes have an optional Minecraft activity to further enhance learning!! You can see the library of SKrafty Classes here. You’ll find that SKrafty’s live and self paced classes use popular curriculum such as Apologia, The Mystery of History, Institute for Excellence in Writing, Life of Fred, Dave Ramsey, and more. If textbooks aren’t your thing, there are also many non-textbook classes available to choose from. All classes are online and allow the students to navigate through them seamlessly with auto-graded quizzes. SKrafty live class teachers present the material, answer questions, encourage conversation around the subject, and even grade papers! SKrafty students LOVE having class with their friends each week. PLUS, there is an optional Minecraft build associated with most classes on SKrafty. Once your student completes their lesson they are given an optional Minecraft assignment to build over on the SKrafty server. They are able to walk around to see other student’s builds as well. So fun! Letting your kids go online to play with others can be a bit scary. Did you know that SKrafty has a large, moderated, family-friendly Minecraft server with chat filters, strict rules about sharing personal information, and other features that make SKrafty a safer alternative? You can head over HERE to see SKrafty’s rules. The SKrafty Minecraft server has creative and survival worlds as well as some really fun mini games for players to enjoy together such as Survival Games, Bed Wars, KitPVP, Sky Giants, Sky Wars, Battle Royale, Factions and more. SKrafty has recently started clubs to encourage our students to explore new hobbies and interests. These include: an online baking club, a photography club, and multiple book clubs with more in the works. Many life long friendships have already been made through SKrafty!! Your student can plug in to the SKrafty community in many different ways. They can take classes & join clubs, play Minecraft, chat on TeamSpeak, have discussions on the SKrafty forum, attend a SKraftyCon, post videos on SKraftyTube all in an adult moderated environment. Watch the video below to learn even more about SKrafty. As a 2018 Back to Homeschool Giveaway Extravaganza sponsor, SKrafty is giving one lucky family a one year SKrafty EDU Subscription which includes unlimited access to the entire library of ALL SKrafty classes. To enter to win, simply use the Rafflecopter form below. All entries will be verified. Open to US/Canada residents only. The giveaway period will close on 8/7/18 at 11:59pm EST. The winner will be announced via email the following day. Good luck! There was a glitch and entries from this morning were erased. Please complete the Rafflecopter form again. I’m sorry! I just found out about Skrafty! This looks so interesting and fun! My son adores Minecraft and he’s always fighting me saying learning can’t be fun. This would certainly change his mind! I’ve never heard of this. Sounds like something we’d like. Thanks for the info! My kids are in love with Minecraft! I’m so excited to find a safe server. Thank you for the opportunity to win! This would be a great opportunity for my son to use his passion in a constructive way and add some fun to school. My kids love Minecraft. What a great way for to learn! Things that incorporate what they love help them to learn. Sounds really interesting. Especially the book clubs. It sounds like a lot of fun! I would even enjoy it! Entering post-glitch. This would be nice for my sons. My daughter is passionate about Minecraft! With this digital age, having information in a digital format is the way to engage these bright young minds and inspire their interests. Having her in a safe community within the digital world would be a godsend, since the Rankup is a bit more than I had planned for this school year. We recently allowed my oldest to start playing Minecraft. I am still very confused by it and a little leary. Allowing him to use it for school in a safe community would make me feel so much better about it. I agree with you! My daughter loves it, too! This looks amazing!! Thanks for the opportunity to win!! My kids would love it! I think this is a wonderful giveaway. I had not heard about SKrafty before today. Thanks for sharing. My son loves playing Minecraft and would be more compelled to explore other things if they are connected, however remotely, to Minecraft. The minecraft aspect would be a dream for my son! My kids are HUGE Minecraft fans. We haven’t really taught them internet safety rules yet and I think this would be a great place to do so. I like that the learning is interactive, offering opportunities to read, watch, create, respond and learn at their pace but with accountability and tracking of their work and progress. My son is loving what he’s seeing in the video about SKrafty! I visited with them at the Teach Them Diligently conference this year. Would love to be able to win this one year subscription! It could really enhance my son’s love of learning. I would love to find something online my son would like to do and that is also constructive. He quickly gets bored with educational apps and websites. Just learned about this! My kids like Minecraft so this would be a fun addition to our homeschool day! My children love Minecraft and I love internet safety! I think my 15 year old would love to learn using Minecraft! Oh my, my boys would love this. Minecraft enthusiasts over here. I have a great rest for winning this. I have a delayed learning 9yo who is very much into Minecraft. P.S. I put wrong user name in for my Pinterest name on one of my responses. This will be my first year homeschooling my son was being bullied and asked me to homeschool so this is all new to me. thanks for all you do. Sounds interesting. Would love to try!